CCC Oxford Falls deliver a stunning new album of powerful worship songs led by Chris O'Brien and made stronger by the return of key vocalist Jackie Brigstock. 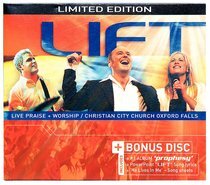 Backed by the brilliant CCC Oxford Falls Worship band and an enthusiastic Church congregation, these songs are ideal for personal or corporate worship, with lyrics universal to all believers. Including the popular favourites 'For you Alone' and 'Dance, Dance, Dance', this is an awesome new worship album!